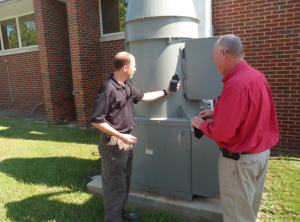 The University of Alabama has developed and implemented a Hearing Conservation Program. The purpose of this program is to minimize the potential of hearing loss by occupational or academic exposure to excessive noise levels. EHS is responsible for managing and operating this program. Elements of the program are: conducting noise level surveys, training and providing consultation regarding hearing protection and conservation measures. EHS shall conduct monitoring for noise exposure levels as indicated. It is the responsibility of supervisors to notify EHS when there is a need for a noise survey. Monitoring is conducted with using sound level meters utilizing the “A” weighted network. Personal dosimeters may be used at the discretion of EHS. Persons exposed to noise levels at or above 85 dBA based on an eight hour time weighted average (TWA) shall be included in the hearing conservation program. EHS shall utilize controls such as noise reduction techniques or equipment in an effort to reduce levels below 85 dBA. Exposure levels at or above 85 dBA (TWA) require inclusion in the EHS Hearing Conservation Program. For more information regarding noise level surveys or hearing conservation programs, contact EHS at 205-348-5905.